The Uganda Embassy in Berlin wishes to relay important information from the National Identification and Registration Authority (NIRA) to the Ugandan Diaspora regarding registration for National Identity Cards. Are you aware that one of the important duties of the Embassy is to provide information, consular services and assistance to Ugandans in the Diaspora within its area of accreditation? Are you a Ugandan residing in Germany, Austria, Czech Republic, Poland, Hungary, The Vatican, Slovakia, Bulgaria, and Romania? Are you a dual citizen of Uganda and any of the countries mentioned above or any other country? Have you acquired citizenship of other countries and/or renounced Ugandan citizenship? Or are you a Ugandan who has not acquired any other citizenship? 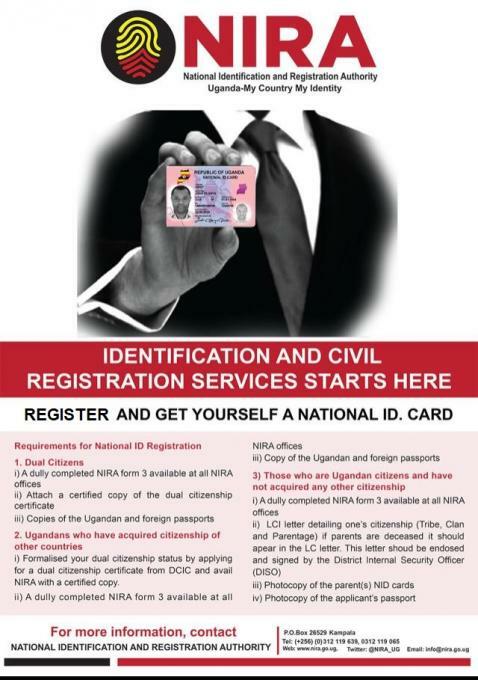 Whatever your answer is to these questions, the Uganda Embassy wishes to let you know that it is possible for you to register and get a national ID card if you fulfil the requirements from NIRA attached herewith. Please note that currently, registration for National IDs is only possible in Uganda. Ugandans in the Diaspora can only register at the NIRA centres in the Districts of their origin or residence where they can be identified or at the Diaspora Desk at NIRA Headquarters, Kololo Ceremonial Grounds. Measures are under way to start registering Ugandan citizens in the diaspora at Uganda's Missions abroad and you will be informed as soon as the necessary infrastructure is put in place. For more details, please visit the NIRA website: www.nira.go.ug.